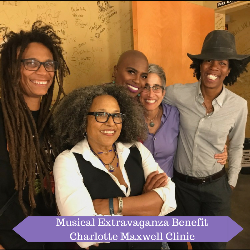 The Charlotte Maxwell Clinic has been providing free acupuncture and other integrative services for low-income women with cancer for over 25 years. 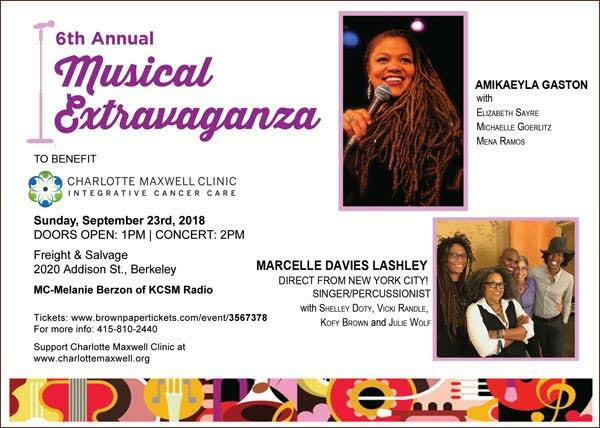 Please join us at the Freight and Salvage in Berkeley on Sunday September 23rd at 2 PM for the 6th Annual Musical Extravaganza to benefit the clinic. Amikaeyla Gaston is a local Bay Area musician and an international award-winning singer and activist. Through surviving a hate crime, she discovered she could become fearless through the healing power of music. Through her activism, she co-creates miracles with music. Marcelle Davies-Lashley is a Brooklyn-based singer and percussionist. Her transformative spirit takes you away into the land of music most loving and beautiful. The universe is better for the music from the depth and gospel jazz-soul fusion of Marcelle Davies-Lashley. Both artists will be accompanied by their extraordinarily talented bands. Please join us for this amazing transformative concert and support a fabulous cause.